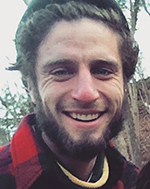 Russell Galanti is from Maryland originally and got his undergraduate degree in Horticulture Science from Temple University in Pennsylvania. 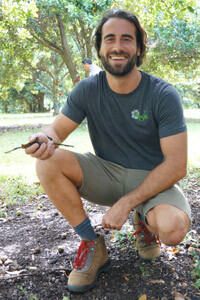 He is now completing his Master's in Tropical Plant and Soil Science at the University of Hawaii at Manoa. He plans to continue his research in improving agro-ecosystem cultural management under the context of sustainable agriculture. Russell's project focused on looking at the effects of five locally sourced soil amendments on plant health and production and soil properties in macadamia orchards. The treatments were wood chip mulch, macadamia husk mulch, husk mulch with biochar, husk mulch with lactic acid bacteria inoculation, and soil profiling. He looked at tree yield, root growth, and tissue nitrogen, as well as soil organic matter, soil nitrogen, pH and electrical conductivity. This project focused on protecting Hawaii's limited natural resources, reducing the need for external resources. A cost benefit analysis was also be performed to determine the economic suitability of such treatments. 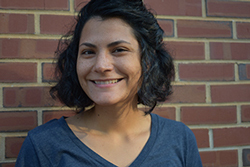 Clara Tang, a master's student at North Carolina State, was chosen based on her project - looking at exploring alternative ways to manage soils more sustainably and seeking to understand the impacts of the use of compost on soil health. Her project evaluated the interactive effect of mycorrhiza and compost on soil and plant health by looking at the change in physical, chemical, and biological properties of soil and how that relates to plant growth. The main focus of the study was to determine the changes in the microbial communities by contrasting sterilized treatments to non-sterilized and determining if the beneficial effects of compost and mycorrhiza were due solely to nutrient addition or also enhanced by the microorganism present in these amendments. Brandon Erny’s winning proposal, "Investigating the use of biochar to increase nutrient retention in compost-production, and following compost spreading," tested the role of biochar, charcoal used for soil amendment purposes, on retaining soil nutrients that normally escape in the compost process. Erny was compost manager at Sterling College in Vermont, where he studied carpentry and sustainable design.